Covellite tumbled stone with a beautiful blue metallic shimmer from Smithville, Colorado, USA. Covellite is a stone of release and transformation. The energetic vibrations of Covellite encourage one to be positive in thoughts and behavior. Covellite supports unconditional love of self and harmonizes the body, mind, and soul. 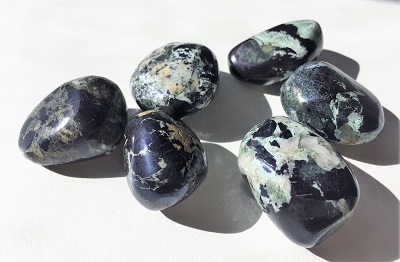 Covellite is a manifestation stone that connects to one to their higher self encouraging the transformation of dreams into reality. Covellite stimulates the third eye chakra and enhances psychic abilities. Covellite may be helpful in relieving negativity and depression and helps one come up solutions to perceived problems and challenges. Covellite eliminates vain and arrogant tendencies and replaces them with an attitude of gratitude and a sense of appreciation. 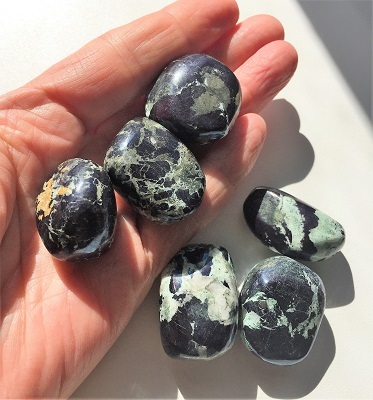 Covellite helps one recognize that when energy flow is properly directed amazing results and miracles are able to come into one’s life. 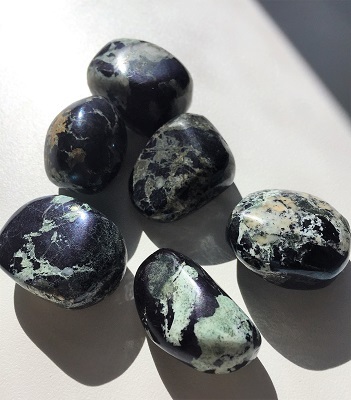 Covellite is a helpful stone for those who feel vulnerable and are anxious in groups. Covellite stimulates the higher chakras assisting the connection to guides and other divine sources of wisdom. 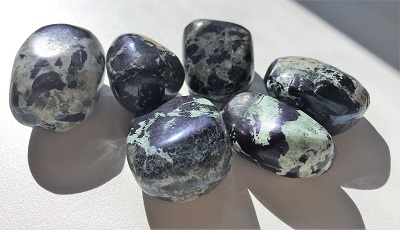 Covellite helps to express spiritual information and knowledge clearly through writing or other forms of communication. In healing, Covellite facilitates energy flow though cells, detoxifying and removing stagnant or blocked energies. Covellite may be supportive in the treatment of cancer as this mineral helps to stimulate healthy cells and purges toxins from within the body. Covellite may be supportive in the healing of disorders of the ears, eyes, nose, and mouth and throat. Due to its copper content, the treatment of arthritis and rheumatism may also be supported by the energetic vibrations of Covellite. This mineral may be useful for woman prone to yeast, fungal, or microbial infections. Covellite may also be helpful for woman with reproductive issues such as infertility and irregular menstrual cycles.